The obstinate pectoralis minor (PMI) can produce a hailstorm of problems throughout the body especially in the shoulders, arm, neck and respiration. Working with it effectively goes a long way in helping you help your clients with neck and shoulder issues, breathing restrictions and even wrist and elbow pain. If the iliopsoas is the hidden prankster of low back pain (Travell and Simons), the PMI is the hidden trickster of the shoulder girdle. This article reviews the anatomy of the PMI, common pathology and suggestions for working with it. Imagine three long fingers extending on an inferior and medial diagonal path from the coracoid process to ribs 3-5 (attachments have been found on ribs 2 and 6 on some folks). This multitasking stabilizer connects the shoulder girdle (scapula and clavicle) to the thorax. The PMI seems to glory in pulling the coracoid process towards the ribs (whether it needs it or not) causing a profusion of myofascial and bio-mechanical distortions. PMI drags the glenohumeral (GH) joint with it as it pulls the coracoid process towards the ribs. Restrictions in blood flow can occur—a portion of the axillary artery lies beneath PMI. 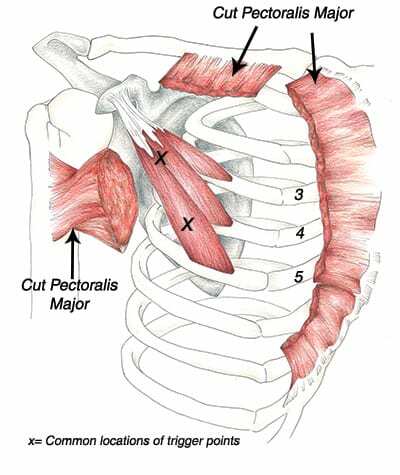 Tingling and numbness (the distal portion of the brachial plexus passes deep to the coracoid process) can also result from the pec minor’s predilection for locking short. When the arm is abducted and externally rotated the artery and nerves are stretched around the PMI close to its coracoid attachment –hence the tingling and numbness. A tight PMI restricts scapular mobility, interferes with the scapulo-humeral rhythm, cause limited humeral mobility and scapular winging. Humeral mobility depends on both scapular mobility and fixation of the scapula at the right time and place. The GH joint follows the scapula. Wherever the scapula goes, the GH joint is sure to tag along. If the scapula is super-glued to the ribs GH joint movement is comprised. My mantra is “Restore scapula mobility and stability and you’ll go a long way to restoring GH joint function”. Let’s do this kinesthetic exercise: Place one hand on the greater tubercle on top of your humerus. Now depress and protract your scapula (the actions of PMI). Can you feel how the head of the humerus went along for the ride? Next abduct the humerus to at least ninety degrees. Feels yucky, right? When the scapula is protracted and depressed the GH joint internally rotates and the greater tubercle moves anterior. That yucky feeling is the greater tubercle colliding with the acromion process. Repeated fender benders between the greater tubercle and the acromion process can result in impingement syndrome, impaired rotator cuff function, disturbances up the kinetic chain to the neck and down the kinetic chain to the elbows, wrists and hands. One of my clients is a hairdresser who had chronic elbow and wrist pain for years. In addition to treating the plethora of trigger points in the flexors and extensors of her wrist and elbows, I treated her massively locked- short PMI, rotator cuff and serratus anterior to restore scapular mobility and weight/energy transfer throughout her upper body. She’s been pain free for several months. If I had just concentrated on her elbows and wrists the results would have been temporary. The moral of this story: always check out pec minor with any neck, shoulder, wrist and elbow pain! My Releasing the Rotator Cuff book and DVD offers an in-depth protocol for releasing this stubborn muscle. Attract and retain awesome clients with stellar skills in working with the shoulders! See Schedule page for complete schedule and registration information.